Ok. Thank you Dr. Thompson. If I get braces a second time for some minor shifting & bringing some teeth down slightly, about how many months would I be wearing them? Also, if you get braces a second time will the finished product look like it did the first time? Treatment time can vary from 12 months to 24 months depending on the severity of the malocclusion. Your occlusion may not look exactly like the first time especially if you are being treated by a different orthodontist that sets the occlusion up differently. I live in California and took my son in for his first orthodontist’s appointment. The person that install the brackets and wires (the entire time we were there) was the orthodontic assistant, not the orthodontist. He came over a couple of times to see the progress, but did not do any work himself. Is this normal? How would I know if the work is done correctly? Thanks in advance. Every orthodontist delegates certain procedures to their assistants. The orthodontic assistant helps the orthodontist in many ways and they are usually highly trained technicians. Some orthodontists are very hands on and some are not. Some delegation is regulated by state law but most procedures are easily correctable and reversible if a problem is found. All orthodontic assistants work under the guidance and license of the orthodontist. In my practice, I work on all my patients however there are some procedures that I delegate to my highly trained staff. For example, impressions, radiographs, bracket replacement and tie ins. I have very little turnover in my practice with the majority of my staff having 20+ years experience. So it depends on the orthodontist and how much experience the assistant has that determines what is delegated in a practice. It is like a physician doing a diagnosis of what needs to be done, like ordering blood work or a chest x-ray that a tech would accomplish. I hope that helps. Good question. I had braces for about three years as adult(age 20-23) and then retainers for Essix for 4 years(more than 18 hours a day) never reduced to night time only wear because the retainer felt slight tight after keeping away for seven hours or more , this worried me so i kept on wearing it, i got very frustrated with it will it. 1.Was it time for night time only mode ignoring tightness? I changed my dentist who bonded with wire at back of my teeth. Still worried i asked for hawley retainer for night time only. No the problem is that after the wire is inserted and with new hawley retainer(I wear it every night) , the retainer doest fell tight at all just fits. So i have few questions again. 1.Is my teeth not moving with wire at back or is it something wrong with hawley retainer ? 2. Is having wire at back equivalent to 24 hrs a day of essix wear. 3.Will i eventually make it to night time only mode for essix after few years of wire. The goal of retention is to allow natural forces to take over as you are weaned off of them. As the teeth try to move out of their good positions, your orthodontist needs to equilibrate the occlusion to reduce the unwanted forces being applied to the teeth. With some adult patients, relapse is a large concern and the patient has to wear them for a long period of time. Also, you may need interproximal enamel reduction to reduce pressures that are trying to move your teeth. Whether you are using a wire retainer, clear plastic retainer or Hawley, or the tightness of them or lack there of, does not matter as much as if your teeth are staying in correct positions without them. Ask your orthodontist what is the long term prognosis for a stable occlusion. But is having wire retainer equivalent to 24 hrs/day of essix(VCR) wear? Why do orthodontist check for gap when checking relapse(for braces done after extraction of teeth)? cant the teeth protrude forward without Gap appearing? In my opinion, a fixed wire retainer will not allow the teeth attached to it to move unless the wire is bent by chewing food or a pencil or pen. With a essix retainer, the teeth can move gingival or rotate slightly. They are not equal in my opinion. They both have advantages and disadvantages. Orthodontists always look during the retention appointment for any teeth that are moving and try to adjust the retainers to stop the movement. A retainer wire can cause a space to open up. If that is the case, the retainer wire is adjusted to allow spaces to close. Some spaces can close by themselves from natural movements. I had to have my braces removed to have two root canals done on molars #19 and #30. After the braces were removed there was a larger sized gap between #30 and #31 but not #19 and #18. This gap did not close. I am in the process of having permanent crowns made for #30 and #19. I haven’t been able to wear retainers regularly for my bottom teeth because of the constant changing of crown sizes temporary etc. First I had an allergic reaction to the original crown materials, so I am on my third course of dental crowns, (zirconia). Right now I am testing the permanent crowns out, but my bite on the left side #30 jaw hurts quite a bit. The permanent crown in #30 fills the space with a ledge that leaves a horizontal space but closes the vertical space between the two teeth. If I look at the crown from the side it appears to be aligned with the natural tooth but shifts outward to #31 to close the gap. It looks like there is a ledge. Why did this gap remain bigger on one side of my mouth and not the other? My dentist also suggested that I leave the teeth alone. She stated that it is difficult to move molars, and if I proceed with Invisalign to move these molars it will be difficult to close the gap? Is it possible to close this gap? or should I proceed with the crown as means of closing the gap? Thank you so very much for your time and help. A small compliment of fixed braces should be able to close the space between #30 and #31. That would be my first option to pursue. Clear plastic aligners may not have enough force to close the space. The only reason braces may not work is if your occlusion does not allow for movement of the molars. With some adult dentitions, they are worn in real well or the molars are in crossbite that the molars are hard to move. Sometimes a lateral incisor is congenitally missing and the cuspid erupts into it’s place. There are two options that can be considered. Option #1: Place the cuspid in it’s proper position and have a false tooth (pontic) placed in the lateral’s position. Or option #2: Place the cuspid in the lateral’s position and shave the cuspid down to look like a lateral incisor. There are certain factors that persuade me to use options 1 or 2. I like option #1 better over option #2 because of the esthetics. The root prominence of the cuspid in the lateral’s position cannot be changed and if the lateral incisor on the other side is small, it is hard to shape the cuspid into a lateral to make them match. I also consider option #1 if the upper midline is shifted to the side of the missing tooth. As the space is opened for the lateral incisor, the midline will shift back towards the middle of the face. Sometimes option #2 is the better option if all the teeth behind the cuspid have erupted too far forward and it would be hard to move them back into the mouth. Also, some patients do not want a bridge, implant and a false tooth. If that is the case, then option #2 is better. Both options can be considered. Advantages and disadvantages of both can be discussed with you and a good choice can be made. My 14 year old got her top two teeth shaved and filed from her ortho with her braces on. One tooth is a little loose, is this normal? Yes, it can be normal. Teeth can become loose during treatment from the pressure the braces are placing on them. Also, as teeth are moved, some adverse positions will be created temporarily during treatment that can cause a tooth to become mobile. We call that “trauma from occlusion”. Once the tooth moves into a better position, the trauma goes away. If the mobility is still present after a week, or it gets worse and you are concerned, call your orthodontist and see if they want to see her earlier than scheduled. My 7 year old daughter has been told she will likely need two phases of braces to correct overcrowding, an overbite and midline issues. I can’t help but thinking the 2 phase diagnosis is a bit of a scam that costs more money and more time. I asked one orthodontist this directly and she said you can correct overcrowding and an overbite with the traditional 1 phase braces once most of the permanent teeth come in, but the midline should be corrected early as the jaw is growing. What are your thoughts on this? Thanks! There are many reasons for early treatment. Some are to lessen the crowding, reduce an overjet (overbite), correct crossbites, create space for teeth to erupt, correct impactions, and modify skeletal growth of the jaws. In your daughter’s case, early treatment may be indicated if the crowding is severe, the midline is way off and the overjet (overbite) is severe. Sometimes we treat early because the malocclusion is very severe. Genetic growth problems of a mandible that has noticeable deficient growth should be treated early. I’d suggest getting two to three consultations with an American Association of Orthodontist Specialist to make a good decision for your daughter. Use the following website to find an orthodontic specialist in your area. I’m a 42 year old male and my front teath till recently have always been notably straight. In the a few months ago for some reason my upper left lateral tooth appears to have started extruding. I don’t have any pain and have had no injuries. Both the left and right lateral teeth feel like they are maybe not totally firm and my front teeth feel like they are under pressure. I went to a dentist who just suggested teeth shift as you get older but it feels like more is going on than just that. What might be going on? What should I do about it? Is it normal for a baby to develop lateral incisor teeth on the upper before central teeth has erupted? It is a little unusual for the primary lateral incisors to emerge into the mouth before the central incisors. I would be concerned when other teeth have erupted and the centrals still have not. The normal sequence for the eruption of maxillary primary teeth is central incisors, lateral incisors, 1st primary molars, cuspids and then 2nd primary molars. If the gum tissue in the central incisor area is bulging, then the central incisors should erupt. They are just having a hard time breaking the skin. If other primary teeth have erupted (ie primary cuspids) and the centrals still are not in, then see your family dentist or orthodontic specialist. Radiographs may be taken to see if supernumerary teeth (extra teeth) are forming keeping the centrals from erupting. I was wondering, which type of braces are more effective- the ceramic braces or metal braces? Also, my bite feels slightly off and in order to fix this would I need braces on both top & bottom or will having braces on either top or bottom fix this? I think metal braces are better than ceramics because the rectangular wire will torque the tooth better in a metal slot over a ceramic. Also, ceramic braces are hard to remove and you have to watch more closely what you eat. Since you have to use elastomeric ties that are clear to hold the wire in place with ceramics, they discolor easily when eating foods like ketchup or spaghetti sauce. To provide a proper occlusion, usually brackets are required on both upper and lower teeth. In some circumstances, braces on just upper or lower can be done but it is more difficult if the opposing non-bracketed arch is not ideally positioned. I hope that helps. I have a clay looking piece that feel out from under my fixed lower retainer and I was wondering if it a cement they used to put it in or if it part of my tooth or something else. It has me really worried cause I am young guy that has okay dental hygiene and I really dont want to look like a hillbilly for the rest of my life. The item could be the fixed retainer cement, your tooth, but it probably is calculus (tartar). The major salivary sublingual gland, that is beneath your tongue, bathes the back side (lingual) portion of your lower incisors. In some patients, calculus builds up in that area behind the lower incisors. The fixed retainer also gives the plaque a structure for easy build up to form calculus. I’d advise that you see your family dentist to evaluate the area in question. the dentist said i dont need braces but i dont like the way my teeth are looking. so do i need braces? If you don’t like the position of your teeth, then that is an indication for orthodontic treatment. Depending on what is wrong and how they are arranged, you may or may not need braces. A retainer or another appliance might be used to correct your occlusion. You do not need to be referred to see an orthodontic specialist. You can get more than one consult. Just tell the orthodontist what you do not like about your smile that you want changed. I had braces for 3 years and I’ve had my upper removable retainer for almost 4 years now. I wear my retainer nightly, but i feel that my upper teeth are still shifting. I think the gap between my two front teeth, that my braces corrected, is starting to develop again. I have only noticed this problem in the last few months. Can I get a new retainer to solve this problem? And if so, is it usually covered by insurance, since I didn’t break or lose it. You can use a new retainer to close the space. After it is closed, sometimes a fixed wire retainer can be bonded to the back side of the central incisors to keep the space closed. This would lessen the chances that the space would open up again and the need for wearing a retainer. As far as insurance coverage, you have to talk with the person at the office who would know. My bottom wire is out and i cant put it back in because of my rubber bands. i want to go to the ortho but if i do i don’t want my mom to pay what do i do?! Usually emergency visits are included. Almost all patients have a problem with their braces that needs an extra office visit. You can call the office and see if they need to see you for emergency care or ask them if you can snip the wire short to make it comfortable until your next regular visit. My daughter has had her braces on for about two and a half yrs now (w/ a new ortho coming into the dental office over this time) Her orthodontist has been using power bands or power chains for approx 8 weeks to close up the gap that still exists between her two front teeth. At her last visit he stated that her front teeth are undersized and he won’t be able to close that gap completely. I am a little frustrated with her not having a “perfect smile” after all the expense and time spent on braces…any suggestions for completing treatment after the braces come off in a few weeks to get rid of that gap? Most gaps between central incisors can be closed. Sometimes they are touching but there still appears to be a space due to the shape of the teeth or how they are positioned. If that is the case, the side of the central incisors needs to be reshaped so that they touch all the way down the side of the tooth or the wire is bent to move the teeth into better positions. Your chances of closing the space by moving the teeth after braces are removed is slim. It is better to address the problem now before the braces are removed. To answer your question, veneers, composite bondings or crowns can be placed by your family dentist on the centrals after the braces are removed to close the gap. The teeth will be slightly wider after their placement. This issue needs to be discussed now, before braces are removed so everyone knows what is going to be done. I am a 52 year old woman who never had braces but am scheduled to get them in two weeks. The problem is that I just had an infusion of Avastin yesterday BEFORE researching the problems with osteonecrosis and Avastin. Can I still get the braces? Is there any risk? I am only getting the uppers done and am having them done in Kuwait and I am not sure my orthodontist knows anything about this subject. If you are taking Avastin (a bisphosphonate), osteonecrosis is a high possibility during tooth movement. In my opinion, orthodontic treatment is contraindicated and should not be performed. Avastin is a anti-angiogentic agent that can cause disturbances with osteoblasts and osteoclasts which can lead to osteonecrosis. Once necrosis occurs, it will never heal. Consultation and approval of orthodontic treatment should be obtained from your physician that is treating you before you proceed. Again, I strongly advise that no tooth movement be performed whether with a retainer, aligners or fixed braces. I wish you well. I received orthodontic treatment some 11 years ago. After the treatment, my orthodontist inserted a retainer on my lower front teeth row. Treatment was received during my teenage years in Germany, now I live in Malta. I went to see a Orthodontist here last week and he strongly recommended to leave the retainer in place as my teeth would move again otherwise. I am very concerned about the metal ion release of the retainer, especially the release of Nickel. I asked the orthodontist about this, but he told me that this is Stainless Steel and would be fine. I found several studies about the release of metal from orthodontic appliances, most of which state that, the release is well below the daily dietary intake. In your opinion, is it safe to keep the retainer long term? Nickel has been widely studied by the orthodontic and dental research community. A good source of publications is found at the American Journal of Orthodontics and Dentofacial Orthopedics. Also, another juried article journal for research on this topic can be found at the American Dental Association’s website. On the AJO-DO home page, search for nickel and many research articles will show. Researchers have looked at amount of nickel released, changes in nickel blood levels, nickel allergies/reaction and nickel desensitivity. If nickel was considered a carcinogen, our profession would not use it in treating patients. OSHA does not regulate nickel as a carcinogen. And lastly, orthodontic products are approved for use in patients by the Food and Drug Administration in the United States. In my opinion, I believe it is safe to keep the fixed retainer. There are many patients who wear fixed retainers for years and our profession believes they are safe. However, if you are concerned about the stainless steel wire, you can have it removed and be fitted for a removable clear aligner or Hawley retainer. If you do so, you will have to be monitored for tooth movement for a period of time. It depends on how large the gaps are and where they are located. A Hawley retainer with fingersprings can close some spaces if they are small. In other cases, a clear plastic aligner can close the spaces. I’d have an appointment with your orthodontist soon for an evaluation and to keep the spaces from getting possibly larger. Hi, I’ve had my braces for about 3 years now and my orthodontist told me I’m getting them off in a couple months which I’m very excited about. However I’m worried I will have stains/spots on my teeth when I get them off. I brush pretty well but I got my braces on early and when I was younger I wasn’t as good with brushing. I can see a little bit of yellow around my brackets, should I be worried? My orthodontist had to talk to me about brushing only once, and it was a while ago. She hasn’t brought it up again. Please help! The yellowing around your brackets may be the adhesive discoloring from foods that you have eaten. If that is true, when the braces are removed, the orthodontist will remove the adhesive that is discolored. When your braces are removed you will know if you have white spots. White spots are caused by plaque decalcifying the enamel. Please read this article about white spots. I would like to know if orthodontists charge extra for having the bottom fixed retainers? My braces will be coming in about 3weeks and I want that retainer that is like glued to the bottom teeth behind them. My sister has that permanent retainer and she said it’s called a “fixed retainer.” She recommended I get it because it will always be on and I don’t have to worry about taking it off. Also, do orthodontists clean and file your teeth after taking braces off? I want some teeth to be filed down because it looks like I have ridges on them. Plus I want them nice and even. Thank you. Another thing, do you orthodontists hate when people ask questions? Because I’m always scared to ask my doctor anything. He’s so serious and straight forward. There are different fees for different types of retainers. As far as charging extra, that depends on the orthodontist. Most orthodontists do make adjustments to the edges of your teeth. And finally, orthodontists like your questions because it gives them the opportunity to help you understand how and why treatment is performed. Make sure you ask questions. Hi Dr. Thompson, so recently my orthodontist gave me these rubber bands to wear because I have an overbite. I wore other rubber bands before like in the back of my mouth but the ones she gave me this time are like a box in the front of my teeth and triangles in the back so they are pretty much covering my whole mouth. It’s really painful because the rubber bands are tiny. Also it’s really hard for me to talk so I haven’t been wearing them to school. (It’s also embarrassing) I know that’s bad but I can’t do it. Also, I can’t eat with them so I would have to go through a lot of hassle of taking them out and putting them in. It’s just really hard even though I want to get my braces off soon. Sorry this is a long comment but my question is, is it going to make my time with braces a lot longer? I wear them pretty much any time I’m not at school, but very consistently. Thanks. Not wearing your elastics as instructed can lengthen your treatment. You need to tell your orthodontist that you are having a hard time wearing your elastics. They may change the length or strength of the elastics. Wearing your elastics as instructed is the best thing to do to obtain a nice smile and get your braces removed. I just had a brace for few days, one of my bracket went loose(not adhere to the tooth by cement anymore, but still hanging to the wire). The problem is : when I eat, food deposit between the tooth and the loose bracket quite a bit to the point that loose bracket flipped over and the wire some time went loose because of that. Do you think I should call my dentist and had him reglued the loose basket now since my next appointment will be more than 3 weeks away. Thank you. If your bracket bothers you, then call your orthodontist and see if they want to repair it. Some patients will have a bracket come loose and still be attached to the wire and not have it repaired until their regular appointment. It is more important to get repairs when you are almost completed with treatment than in the beginning. I hope that helps. I’ve asked an orthodontist about my case and he told me about “Camouflage” that he will do inclination to my teeth to hide my malocclusion , and another orthodontist told my about “Damon System” and I am reading now about MEAW Technique. so what is your recommendations in general, because I know its difficult to judge without clinical and radio graph examination. Diagnosis and treatment planning would be determined with models and cephalometric analysis. The multi-looped edgewise archwire (MEAW) could be used with intra-arch elastics if you have an anterior open bite that isn’t severe. If you have a mild Class III malocclusion, then inclination of the upper and lower incisors can get rid of the anterior crossbite. If your occlusion is a moderate to severe Class III, a surgery approach should be considered your best option in conjunction with braces. FYI, I use edgewise brackets and do not use self ligating brackets. So it depends on the relative position of the jaws, initial position of the teeth and amount of crowding, in determining the proper course of treatment. I hope that helps. I got braces about 3 days ago and 2 of my brackets aren’t glued to my tooth, in other words their loose. Should i get them glued on as soon as possible and if i don’t get them glued on to my teeth as soon as possible will this add time (years) to my braces? Thanks! You need to contact your orthodontist and find out if they want to place them back on before your regular appointment. It will not add years to your treatment. The more critical time for a repair is at the end of treatment because a tooth can move out of alignment quickly and delay getting the braces removed. Does the speed at which a single tooth is extruded have an impact on whether or not the bone and gingiva follow? No, when extruding a tooth, speed is not a factor nor is it considered by the orthodontist. The bone and gingiva should follow the tooth as it extrudes. The rate at which a tooth extrudes is not determined by the forces placed on the tooth but rather the biologic factors that inhibit its extrusion. Extrusion is one of the fastest movements that can be made in orthodontic treatment. For example, a very light .014 NiTi wire can move a high maxillary cuspid down in one month. I hope that answers your question. Should the same hold true for a patient with some recession and about 15% bone loss? In my situation, teeth 7 and 10 were extruded 2 to 3 mm, except the bone and gingiva did not follow. Now, 2 to 3 mm of my root is exposed. The teeth are very sensitive. They also look irregular and out of proportion. I am very troubled by this, and wish I could just undo the extrusion. You need to discuss with your orthodontist the areas of concern. Normally bone and gum tissue follows the movement of the tooth. Your orthodontist can move the teeth back. I’d have to do an examination or see a good photo to give you other options. My 16 yo daughter has a congenitally missing #10 adult tooth. She had braces for two years to make space for a future implant. However, now she is adamant about not having an implant as one of our friends is experiencing an implant failure. Now I’m also a little worried about the implant route for her. Her braces came off two months ago. What are her options at this point? Your options to replace #10 are an acid etched bridge, a conventional bridge, a partial denture and an implant. An acid etch bridge is not as durable as a conventional bridge. Most people do not like the partial denture because it takes up tongue space. And, a conventional bridge has to remove good enamel from adjacent teeth for the abutment crowns. All of them have their positives and negatives. I’d still lean towards the implant. I’ll look into the options your mentioned. It’s rather hard to persuade her to continue to consider an implant at this moment, though she wouldn’t be getting one for at least another couple of years anyway. In your experience what percentage of implant failures have you seen? Is it possible to go back on braces and just close the gap at this point or sometime in the future? Her #7 is rather small so can the orthodontist just pull #7 and use a powerchain or something to pull her top teeth together? Esthetics aside, can canine substitution be a viable option if she chooses? I know it’s been done before. The American Association of Oral and Maxillofacial Surgeons report a 95% implant success rate. Patients who are over the age of 60 with certain health histories like smoking, diabetes, head and neck radiation, postmenopausal or on hormone replacement therapy experienced significantly increased implant failure compared with healthy patients. I would say closing #10 space is not an option because your orthodontist didn’t treatment plan to close the space. If you did close the space, the occlusion will be incorrect and the midline would shift to her right. Also, extracting #7 is not an option. Bone circumference determines if a maxillary cuspid can be used to replace a lateral incisor. If bone circumference is normal or large and the space was closed by retreating, it may not be stable and spaces open back up after retention was stopped. I wouldn’t retreat and continue with replacing #10 with the above mentioned options. I had braces when I was younger and wore my retainers for some time. I have stopped over the years and then about 4/5 years ago purchased a new one, but did not wear for quite some time now. I noticed my underbite looks like it’s coming back a drop. I tried my retainers on. The top one is tight but feels like I can adjust to it. The bottom one is a lot tighter. It goes on, but feels like it might pop out. I can handle the pain until my teeth adjust. I just want to make sure it’s not dangerous to my teeth and that it won’t do more harm than good. You can start wearing your old retainers again. They will move your teeth back into a better position. I’d advise that once you have worn them for a while and the teeth have moved, visit your orthodontist and see if any adjustments to your teeth or retainers are needed. Excellent website you have. Really interesting to read everyone’s questions and your answers. I am very happy with my orthodontist, but sometimes I feel there is not enough time to ask the million questions that I have. This website has been a great help. My question is about the different wires and what they do exactly. I have had braces for a few months now and am now on a rectangular wire for my upper arch and on my second round wire (0.18) for my lower. However, some of my teeth still aren’t completely in place. My two front teeth aren’t level yet (one is slightly longer), and two other teeth are still a bit rotated. I thought that the first wire was supposed to completely take care of rotations and alignment issues, and next wires would take care of occlusions/overjet/crossbite? Will the thicker wires still take care of the rotation problems? Also does it ever happen that teeth are just too persistant and don’t align or rotate no matter what wire is used? Thanks for the complement. I’m just trying to help. An orthodontist has a variety of items that can be used to create an ideal occlusion. Our wires come in different sizes and materials. Nickel titanium wires are very flexible and are used to rotate teeth. Slowly the orthodontist moves into heavier bendable stainless steel wires to place final bends. To answer your questions, rotations are usually taken care of in the first part of treatment with smaller flexible wires. Besides wires, elastic power chain and open coiled springs can rotate teeth as well. It is harder to rotate a tooth with a heavy wire. Leveling the occlusal plane and correction of some crossbites is performed by heavier wires and bending the wire. The overjet is usually corrected by elastic wear and there are other devices that can be used to make the lower jaw grow. With some adults, some teeth will not move at all. It takes some time to determine which teeth are not moving. This could be due to trauma and ankylosis of the teeth and can cause difficulty in achieving all our goals. Orthodontists usually work in a specific order of treatment so that no time is lost while moving teeth. Greetings. I am 39 yrs old, got braces to close the gaps between my lower teeth 3,5 months ago. We do not see any improvement what so ever. Could i have your opinion on that please? My doctor says, they should have moved already, she even suggests that to take them off as they seem not to be working. I have medical condition so i cannot have surgery if you were to suggest. Best wishes. There is a variety of reasons spaces would be difficult to close. In some cases, bone density (osteopetrosis) can prevent tooth movement. Any type of past trauma in that area can cause osteosclerosis or ankylosed teeth which prevent tooth movement. Also, in adults, tooth movement can be very very slow. If any tooth movement is observed compared to your initial dental models then there is a reason to continue with treatment. It may take double the time, but it can be accomplished. Can you suggest the best corse of action regarding the permanent retainer I’ve had on my upper teeth for about 8 years. The wire on the right side has recently loosened & I’m wondering if it’s best to let nature take its course or have the retainer repaired. Please outline approximate costs involved. If the upper fixed retainer is being used to keep a space from opening up between your central incisors, then have it repaired. A removable retainer will not keep the space from opening back up. Some patients have a high chance of relapse in this area. If you don’t have a problem with a space showing up, then you could use either a clear plastic retainer or a Hawley retainer. Prices vary from orthodontist to orthodontist. There is no standard fee. The reason to place a removable retainer is so that if your teeth try to move rapidly after the fixed retainer is removed, you can keep them from moving as your orthodontist makes adjustments. I’ve had braces on for about 9 months now and my teeth have been straight since the 6 month. However my orthodontic says i have a good year left. I don’t understand why i would need a whole year , if she advised me not to wear rubber bands anymore and my teeth are straight already. Also because I have a root canal, I’ve been feeling nothing but pain. My question would be, is it better that i just stick with this pain for a whole year or recommend for my braces to be removed and stick to retainers. I would continue with the treatment plan as outlined. There are many movements that are slight but yet are needed to create a stable occlusion. What you may consider straight, an orthodontist can see a large list of movements that are needed to complete the treatment. Also, once we get the teeth in good positions, we hold them there and allow the gum tissue fibers to be replaced over and over again which lessens the chances of relapse. My orthodontist put on new wires for me yesterday that he said would “move up” my bottom teeth. This new wire (a loop) has been digging into my gum (not my lip) and yesterday the pain was really really bad. It felt like someone took a nail and was digging into the gum constantly. So I took my nail and sort of held it away a tiny bit which helped. Then I tried shaping it away from my gum, which didn’t work out. Later, I somehow went to sleep and when I woke up today, the loop has completely dug into my gum. When I called them to ask if it’s normal, there was a message saying that they’re on vacation. Please help me, and tell me if this is normal. Thank you so, so much!! When orthodontists use loops in the wire, they can be very close to the gum tissue. The gum tissue can swell and the loop looks like it is digging into the gums. Brush the area often and use your fingernail to pull the loop away from your gums. This will not hurt or deactivate the wire and will give you relief. I had braces for 10 months and my ortho did stripping in the begninning. After braces, i have been wearing plastic retainer for the last 5 months only in the night. But from few days one of my upper front teeth is feeling very loose. when i press it with my finger or tongue, it moves. I’m really worried and need advice. Your tooth may be mobile for a variety of reasons. You could be placing pressure on your teeth from clenching or grinding. Your retainer or occlusion may need adjustment. You should show your orthodontist the tooth that is mobile. Eventually, after adjustment, the tooth should become normal in it’s mobility. I have a baby canine tooth that never fell out and now my permanent canine is coming in, in front of the baby tooth. This has cause a huge gap on the side of my mouth and my smile isn’t so pretty anymore. What should I do to get this fixed? I need to get something done soon since I’m in a wedding this June. Permanent cuspids (canine) teeth can erupt in a way that doesn’t remove the primary cuspid root. You probably need the baby tooth removed so that the cuspid can erupt into position. If you can’t remove the baby tooth, consult with an orthodontic specialist for treatment. Hi, I am getting my braces off soon and I’m REALLY worried I’m going to have stains or white spots on my teeth afterwards. I brush pretty well, however I have a couple small spots of white that I can see on my teeth. How can I tell before I get them off? I am really anxious! Decalcification can occur anytime during orthodontic treatment if you don’t keep the plaque from accumulating on your teeth. They will look like white spots. Now there are natural white spots that occur in the enamel called dental fluorosis. Dental fluorosis is caused by a high concentration of fluoride disturbing the development of enamel during tooth formation. So, the white spot that you see on your tooth may be dental fluorosis. The only way you will know if you have decalcification is to ask your orthodontist after your braces are removed. Make sure your read my article on how to treat white spots. I had my bottom braces for 6 months now and I recently just got my top ones, I then noticed the bracket on the front teeth was moving because the glue came off. Because of the long waiting at my orthodontic and no one can take me every time because of it should I leave my bracket or get a appointment? I’d call the orthodontist’s office and see what they want you to do. Sometimes it’s ok to wait until your regular appointment for a repair and sometimes it is not. If it is an upper bracket, you can probably wait. If it is a lower anterior bracket, you probably need to get it repaired soon. Lower teeth that were rotated tend to rotate back to their old position quickly. There are other factors to consider, like are you wearing elastics? Only your orthodontist can advise you. So, call the office and tell them what has happened. They can give you the best instructions. Again, I think you should talk with your orthodontist about this problem since you only see them every 9 weeks. They know your situation best and can give you the proper advice. If you have food stains, they can be removed by getting your teeth cleaned. The braces are removed with a special pliers and then the adhesive is removed. Usually the orthodontist will send you back to your family dentist for a prophy. Thank you!! That is very helpful and makes me less nervous. However I recently noticed white spots on some of my bottom teeth that won’t go away. Please help! I think they will be white spot stains when I get my braces off! I read your white spots article, but I am still really scared. Thanks! If you have decalcification, your orthodontist can prescribe a strong toothpaste like Prevident 5000 to reverse the white spots. hi! i am 13 years old, almost 1 year into my orthodontic treatment. i have 3 questions. Until now, on my top teeth, the orthodontist only placed brackets on my incisors and canines, but not my molars. Why is this so? Also on my 7th appointment, the orthodontist placed a power chain on all my bottom teeth, and only the incisors of my top teeth and skipped the canine. Why is this so? Also, i have been wearing elastics since my 7th appointment. On my 8th appointment, the orthodontist didn’t use power chains anymore but the usual o-rings. Why is this so? Thank you for reading my question!! I have a question my orthodonist said to me if you break another bracket we are going to stop the treatment and I broke one by eat chicken and it had a bone in it and I didn’t know and now one of my brace breaket broke and im very scaryed and sad because they are goig to atop my treatment. But i saw on the internet that you can say no because you are paying him good money is it true? Discontinuation of treatment can occur at any time by either party and the orthodontist or patient can stop treatment for a variety of reasons. Chances are, your orthodontist is not going to stop treatment. You need to talk with your orthodontist about how you can keep from breaking brackets and that you are trying to be careful with your braces. Hi. I have metal braces on my lower teeth. Yesterday I was eating hard candy (A no no I know!!) , and the buccal tube on the back of my teeth broke off. I am not able to make it to my orthodontists for another couple of weeks. I was wondering, what is the function of the buccal tube? Does it secure the wire, holding it in place, to make sure the teeth move correctly? Can the teeth still move without the buccal tube? Will their be adequate pressure on my teeth without the buccal tube? I just don’t understand how if the buccal tube is gone, there can still be pressure on my teeth. Maybe I am not understanding its function correctly! Please help. Thanks. A buccal tube secures the wire and helps move teeth that are anterior to it. Since you are going to see your orthodontist in a couple of weeks, you should be fine until then. However, call your orthodontist. Tell them what happen and they can set up a repair appointment if it needs to be repaired earlier. My daughter had braces on for a year to fix the gaps in her smile. She went to the Hawley retainer right after. She has had health problems ever since. She experienced nausea and headaches for months. One night she was so sick that she didn’t put in her retainer. The next day she felt a little better. It took a few days for her to feel 100%. We took the orths’s advice and put the retainer back in, and her symptoms came back. We stopped using the retainer. I am afraid that she is allergic to the metal or the poly that the retainer is made out of? Her doctor thinks i am nuts? What should we do? I would modify the upper Hawley retainer into a “horse shoe” shape so it doesn’t cover the roof of her mouth. Some patients just do not do well with a Hawley retainer covering their palate. If she doesn’t do well with that modification, then I would change the retainer to a clear plastic retainer that would retain the teeth in good positions and eliminate the metal wire. It is possible the headaches are from the retainer being too tight and the nausea from a hyper gag reflex. Allergic reaction to the metal or plastic is rare. Thank you for your quick response and advice! I appreciate it! Hi Dr. Thompson, I’m 14 and I am considering going to an orthodontist soon. I was just wondering if it is normal to have your top front teeth scrape against the face of your bottom teeth when you bite down? Also, do I have an overbite? My front teeth cover a little over half of my bottom teeth? It sounds like your incisors are not angled properly and you have a deep bite. A deep bite is when you are biting down, you don’t see 80% of your lower incisors. An overjet is the distance between the incisal edge of the upper to lower incisors when you are biting normally. A 1-3 mm overjet is considered normal. Overjet is the horizontal measurement. Deep bite is the vertical measurement. Thank you for answering, I really appreciate it. Tooth #3 was extracted. Upper right quadrant has shifted and bite is deep. What would be the best type of Orthodontics to move upper right quadrant into the original position pre- extraction? I was considering “Inman Aligner”. Also, would a min- implant be a good choice to replace missing tooth? Thank you. Since the upper right quadrant has shifted and is deep, I would use traditional fixed orthodontic appliances (regular braces). I think a removable device, like an Inman Aligner, will not allow for enough control over the forces need to open the space and get rid of the deep bite. After #3 space is open, an implant could be used, if there is enough bone. I just got my braces off on Thursday and gave me a bottom permanent retainer and showed me how to floss. I flossed before going to bed, and I guess I flossed a little too hard because my bottom retainer fell off. My orthodontist are closed fri-sun. It is now Friday and my bottom teeth are starting to get a little tender. Should I be worried? I can go in on Monday, but I am concerned my teeth will get back to how they were before. Teeth can move the most right after braces are removed. You need to call your orthodontist’s emergency number and talk with them. Depending on your original malocclusion and other factors, they may want to place the fixed retainer back very soon. I was looking on the internet about braces. Then I came across a website that sells braces. Like the brackets, wires, and everything else. I was wondering if someone could buy them and ask a Orthodontist if they will put them on for a small cost? Or for free. I don’t think you will find an Orthodontist to do this for you. The cost of braces is not in the materials used but in the professional diagnosis of what needs to be done and treatment appointments over the years. Trying to treat one self is ill-advised. Also, an orthodontist would not take on the legal issues of applying braces without continuation of treatment and follow-up. Finally, orthodontic materials over the internet are not regulated by the FDA and could pose health problems. My dentist just extracted two second premolars on my upper row of teeth. I have no crowding of teeth, just a slight overbite/overjet of the upper row.. May i ask what is the reasoning in choosing to extract the second premolar or the first premolar, as well as the pros and cons that come with it? As i have seen around my friends’ cases its more common for first premolar extraction. It is more common to extract 1st premolars than 2nd premolars. Which to remove is based on how far the molars need to be moved forward. If the molars need to be moved a lot, then 2nd premolars are removed. So it depends on the initial relationships of the molars and the amount of overjet that needs to be reduced in determining which premolar to remove. What is the difference between skeletal overbite and dental overbite? How you determine whether you have a receding chin. What is the difference between traditional and functional orthodontics? 1. Most people when they ask about an overbite, they are asking about an excessive overjet where the patient has a large horizontal distance between upper and lower anterior teeth. A skeletal overjet is created by too much discrepancy in the positions of the upper and lower jaw due to excessive growth of the jaw or lack thereof. An excessive overjet can be caused by the upper jaw being too far forward or the lower jaw too far posterior. Orthodontists use cephalometric measurements to determine positions of the upper and lower jaw and treat accordingly. Most of the time, an excessive overjet is due to deficient growth of the mandible. A dental overjet is created by the angulations of the anterior teeth but the jaw positions are correct. 2. The mental protuberance of the mandible, our chin, varies from one person to another. Nice facial profile esthetics requires harmony between the nose, lips and chin. If the chin is too far forward or non-existent, a genioplasty or mentoplasty can be performed by a plastic or oral surgeon. Most decisions to change the chin position is from patient’s perception and wishes. 3. Traditional orthodontics, in my opinion, is fixed orthodontic appliances (braces). Functional orthodontics is the use of growth modifying appliances, in a growing child, that changes facial profiles and enhances bone growth. An orthodontic specialist uses a combination of both functional and traditional orthodontic techniques to correct the malocclusion and create facial harmony. One of the reasons for long treatment times is to reduce the chances of relapse. By holding the teeth in a good position, the gum tissue and bone can remodel and reduce the chance of movement after braces are removed. On another note, you may want to ask your orthodontist to get rid of areas that are irritating. Finally, you can always ask your orthodontist when they think braces will be removed and what other items need to be corrected. Remember, orthodontic treatment is usually over a long period of time because teeth move slowly. Hi, I’m 19 years old is it too late to receive treatment? My top front four teeth are crooked, there are gaps in them and some are higher up than the others and I have what I think is called a reverse bite where the bottom jaw is in front of the top (I’m assuming this caused it) . I also now have a receeding gum lines on these teeth. So would I be able to get treatment, what would it be and what would it cost. Chances are you would need standard orthodontic treatment with fixed appliances (braces) which can take up to two years. You probably would wear elastics rubber bands during treatment to get rid of your underbite. Consult with a orthodontic specialist for what treatment is needed, length of treatment and the cost. I had an exposure and bonding surgery on my impacted tooth (the one next to my growth tooth on the left side) in April and got braces fitted on in May. I can see changes in my teeth overall but the impacted tooth is not even showing. During appointments my orthodontist shortens the gold chain but doesn’t pull it or apply any pressure that I can feel.Should I be worried about the progress of the impacted tooth? Ectopic / impacted cuspids are one of the hardest things to correct in orthodontics. Your orthodontist is placing light pressure on your cuspid by shortening the chain and it sounds like it is progressing well. It usually takes a full year or longer for the cuspid to show. There is always the chance that the cuspid will not come in and will have to be extracted. Talk with your orthodontist about the cuspid’s progress at your next visit. With a radiograph or by examination, they can tell you how far it has moved. I’d like to know if it’s a problem to go on a 3 month holiday in a different country from the one where I got my braces on. Is it going to be a problem not having check-ups for 3 months? There are times when a patient of mine goes on a long vacation away from the area visiting family during the summer or is out of the country for a good period of time. The only thing that needs to be done is to tell your orthodontist that this is going to happen. Your orthodontist will change the wire and how it is tied in so that less problems will occur while you are away. I change from elastic ties to wire ties. The elastic ties that hold the wire in place can deteriorate over a long time and fall off. Then the wire would come out. So you can go a long period of time without a check-up. Ask your orthodontist for a list of orthodontists in the area you are visiting, just in case you have an emergency. Hello Dr. Thompson. I was 36 years old and I had a palatal expander in for one year, braces for a year following and upper jaw surgery towards the end. I didn’t wear my retainer regularly while I was pregnant and my teeth have shifted. My orthodontist wants to put my upper braces back on for a few months, which is what I expected. I didn’t think to ask during my last appointment so I decided to do some research online, is it possible to have the palatal expander put back in? I’m unsure if it is an option since I had the jaw surgery but I still think my palate is too narrow. I rushed the expander and braces at the time because my wedding date was approaching and now I’m thinking that I shouldn’t have. Is it possible to expand it more at this point? Yes, you can have a palatal expander again if it is needed. Sometimes all the expansion can be done by braces only and an RPE is not needed. If you have had relapse, you may need surgically assisted rapid palatal expander (SARPE) in which surgery is performed with the expander in place. Since your orthodontist only mentioned using braces, then an RPE is probably not needed and the braces will take care of the expansion. Hi, I am currently wearing braces and my treatment is expected to be complete in 4-6 months. The problem is I may be going abroad for a wedding in 3 months and I was wondering If I can ask my orthodontist to remove the fixed braces for a month and then have them back on when I return. I understand it may cost to have it removed and then back on, but is this scenario possible ? It is a possible scenario. I have rarely taken them off and then put them back on. A lot of time is lost and wasted. Since it is 3 months from now, you may be close enough to get them off permanently before the 4-6 months. I’d call your orthodontist and tell them of the situation. Based on what further treatment is needed, they will advise you of your options. Hello! Love your website and thank you for taking the time to answer questions. Once a tooth is pulled down using a bracket and chains, does the root of the tooth bond to the gum tissue and not move? Just FYI. The roots of all teeth are surrounded by gum tissue at all times. The root and the bone never touch. We call it the periodontal ligament (PDL). So as an impacted tooth comes through the gum tissue, the tissue recedes to the cementum enamel junction (CEJ). That is where the crown exits the gum tissue. The tooth is held in the alveolar (bone) socket by the PDL. Will the extruded tooth move once braces are removed? It’s always possible that the tooth will move slightly back up where it came from. So the gum tissue does hold the teeth into position but any continuous force placed on the tooth can move it out of position. I hope that answers your questions. Hi, I have had my fixed braces for about 6 months now, and in the past few weeks I have noticed brown stains around 6 of my bottom row teeth. My bottom row teeth are small and angled funnily, so it is difficult to get to. I was wondering if there was anything I could do now to remove this or is there anything that the orthodontist could do when I go and see him in 2 weeks? Are these stains permanent or is it possible for him to remove them when I go by cleaning it or do I have to wait until the end of my braces treatment? Thank you. Chances are the adhesive around the bracket is changing color from the foods you eat. It could also be the beginnings of a cavity. You need to ask your orthodontist about the stains when you see them in two weeks. Also, you should be having regular 6 month prophys at your regular family dental office while in orthodontic treatment. They can clean around braces with a prophy jet and get rid of the stains. You need to see an orthodontist to get back on the path. They will advise you on how to wear your rubber bands. Use the American Association of Orthodontists Website to find an orthodontist in your area. Regular monthly visits are needed to advance your treatment. It can be that your orthodontist needs a certain type of bracket or band on your upper molars. It takes a couple of appointments to place bands. I would not worry about it. Eventually, there will be attachments placed. I went to the dentist about two weeks ago for the first time in like three years (whoops) and he comment on how i had an “extreme overbite”. I am a serious grinder, I have ground my teeth flat. And yes, I do have a bad over bite. I feel my grinding may have something to do with my overbite. I am very worried about how this may effect me in the future. My top teeth completely overlap my bottom teeth, and it sometimes causes my jaw to become stiff and sore.. Could I get braces just to correct my over bite? And if I do would it have to be both top and bottom? How long does someone usually have braces? Orthodontists use upper and lower braces to correct overbites and it usually takes two years. Once your braces are removed, you may need an upper splint (bite guard) since you grind. The splint can hold the teeth like a retainer and also keep you from grinding down your teeth further. Use the American Association of Orthodontists website to find an orthodontic specialist near you. Treatment planning requires records, examination and measurements be taken. Since you have described your malocclusion as a Class II Division I from a skeletal Class II relationship, my thoughts would be leaning towards orthognathic surgery with braces to get rid of the overjet and crossbite. Depending on the severity of the malocclusion and the wants of the patient, the treatment plan could consist of extractions of upper premolars, a non-extraction approach or orthognathic surgery. Once you have had records and an examination from an orthodontist, they can advise you of the best treatment plan. I just had braces on for the first time on my upper jaw yesterday, I slept through the night only to wake up to an intense pain on both of my front teeth, specially on the left one, it feels as if it’s numb and the pressure doesn’t go away even through I’ve taken two pills of Advil. Is that normal? It can be normal especially if you are an adult and have many rotated teeth. Usually the day after braces are placed is the worst day. It will slowly get better. It takes about 3 to 7 days for the soreness to go away. If the soreness keeps you awake at night, then call your orthodontist. Are dental impressions mandatory by law for getting braces? 4 orthodontics offices in my area said they do impressions for every patient. 1 office said impressions are for surgery patients and patients that will need devices. I was told since my case is minor, that the digital photos and good health of my jaw bones visible in the panoramic X-ray gave them sufficient information to proceed with the braces installation without taking dental impressions. Just wanted to make sure this is kosher. It is standard practice to make patient models at the beginning and at end of orthodontic treatment. I have not seen a state statute requiring certain items for records however for diagnostic and legal purposes an orthodontist usually takes impressions. To answer your question, I do not think there is a mandatory law. FYI, impressions can be by-passed in some practices that take digital scans of the mouth. No impressions required. It is hard to get around an impression since we use the models to make a lot of our appliances. My daughter is only 9 but I am aware that her canine teeth are growing very high up on the gums. Will she need braces or will they grow down eventually? Is this a common thing and I am worried that her back teeth don’t have enough room to grow, please help. Your daughter is getting her teeth early if her upper cuspids (canines) are erupting at age 9. Since upper cuspids come in relatively last and if there is crowding then the cuspids will erupt high on the gums or not at all. An orthodontist can create space and help the cuspids erupt and not become impacted. The only way to know if there is enough room for all of the teeth is to have a consultation with an orthodontist. Most patients do present with dental crowding and rotations of teeth. Hi i have my palatal expander on for a week now and i don’t see any front teeth gaps yet? I turn in 1nce a day according to my orthodontist. Sometimes a gap does not show up for a while or at all. It depends on where the expansion screw is located, the shape of the bone and the amount of crowding. Yes, I think you are turning the expansion screw correctly. You should see the new hole and feel pressure. Some patients do their own turns just like you did. Make sure you turn it from front to the back as your orthodontist has instructed. I have had my dental surgery done in November 2013 and two chain brackets were attached to my upper cuspids (canines) teeth. One tooth (canines) came down slowly (over four months) but not visible through the gum yet. Today (February 23, 2014) the bracket attached with the tooth came off automatically. Should I be concerned? Do I need to do the surgery procedure again or the tooth will come down naturally now? The tooth has moved down significantly from upper top gum? The other tooth with the bracket and chain are fine still. I have been going through orthodontic treatment over a year and I have braces on. Sometimes a bracket and chain that is attached to an impacted cuspid will come off. This happens when the bracket and chain are placed in a wet field and the adhesive will not be at its maximum strength. Your orthodontist will evaluate the cuspid to see if it will erupt on its’ own. They may ask for the procedure to be done again. It depends on where the cuspid is located and how it is angled. I would not be worried about it. It sounds like your cuspids are moving well. At your next visit, your orthodontist will make a decision and advise you. I decided to get braces as an adult, mainly because of a very poor bite and a gap between my front teeth. Well I’ve had my braces for a little over a year now, and at my last appointment my orthodontist approached me regarding an adult tooth (bicuspid?) that I had had removed when I was about 12. (It probably shouldn’t have been taken out, but that’s another story.) He said that all of my top teeth have been shifting towards that spot, and he wanted to know if I’d consider getting a dental implant to replace it. Otherwise, I’ll never have a perfect bite. He has never said anything about this before, and it will require more time in braces to open the space up enough, as well as the expense of getting the implant. I’m pretty hesitant about it, and I’d like to get your opinion. Is it worth the extra time and money at my age (35 years)? I’m also wondering if maybe he will be unable to close up the gap in between my front teeth due to this extra space since there has been a lot of movement, but still the gap remains… Thanks so much for your input! The factors involved in making decisions whether to open a space up or close it are the bone size, width of the teeth and starting positions of the teeth. In some cases, spaces can be closed. In other cases due to bone size, spaces need to remain open. It appears that your orthodontist has tried to close spaces and now has determined that the premolar (bicuspid) space needs to be opened to obtain a proper occlusion. Orthodontists leave options open with adults because the teeth don’t move as easily as in a child. Treatment plans change. To obtain a stable occlusion, your premolar space probably needs to be opened and then the space restored with a bridge or implant. As far as the space between the central incisors, it should close. In some cases the frenum, a cyst, or supernumary teeth keeps the gap from closing. Without an examination or photos, I’m just guessing as to the reason it is not closing. hey! I am 22. I have my maxillary left lateral incisor in between the central incisor and canine but slightly pushed back. It grew after the canine was fully grown. now it really annoys me and makes me awkward everytime I smile.. what’s the best way to correct this prob, if i dont want to get the tooth removed. I think you have three options: A Hawley retainer, if there is enough room to push the tooth forward, clear plastic aligners or braces. Don’t have the lateral incisor removed. If there is a little bit of crowding, then clear aligners could be used. If there is a lot of crowding, braces would be needed. Okayy Thankyou, I’ll surely try one of these. My 16 year old son got his braces off 5 months ago and then had all 4 impacted wisdom teeth removed a month later. The orthodontist is concerned that my sons top second molars haven’t come in yet and put in spacers today hoping to give them more room to erupt. We see him again in 2 months. Is it rare for a 16 yr old to still be without second molars? Let me mention that he was a late bloomer with his teeth, not getting his first tooth until over a yr. old. My other concern is, when the second molars do finally come in do we have to worry about the teeth shifting? Patients can have extreme eruption times. I have seen patients have all their adult dentition at age 8. And I have seen patients way past age 18 receive their 12 year molars. When a patient’s teeth erupt late, compared to the average, all of them will erupt late. Is it rare that he doesn’t have his 2nd molars at age 16? Yes, but he is in the 1 percentile compared to the average. If the radiograph shows that they are pointing in a good direction, I would not be concerned. As they erupt, if your son wears his retainers, it will keep the other teeth from moving. Also having the 3rd molars removed will help keep crowding from occurring. Hi Joseph! I’ve always loved your site and figured it was time i asked a question. I recently got my braces removed and received Hawley retainer for my upper teeth only. I also have permanent lingual retainers for both my upper and lower teeth. My ortho said that i should wear my removable Hawley only half a day because if i wear them too long (ie, 24 hrs/day) the wire could (would?) shift my teeth. If i am remembering what he said i believe he was referring specifically to the wire on my upper posterior molars that the Hawley has (both sides of my face). I could be wrong. As you know Hawley retainers have a wire that runs horizontally on the anterior and then there is a wire flap that is on both sides (mine hang off of the 2nd molar tooth on each side — in Canada these are #1.6 and #2.6). These flaps are what i use to push down on to detach my retainer so i can take the entire retainer out of my mouth. So i am confused. I always, Always read online that one can never leave their retainer in too long (i just googled it now and see 3 articles saying those same words verbatim). So what is my orthodontist talking about? In my opinion your orthodontist may be considering one of two things. First, your orthodontist may want your teeth to settle. We sometimes allow the teeth to move by natural forces so that the occlusal cusp tips can hit each other and as the teeth erupt, they settle into a better position than when the braces were removed. Secondly, if on the other hand your occlusion interdigitates very well, the adams clasp on your Hawley retainer could open spaces between your molars and premolars. The wire is forced between your teeth from the opposing occlusal forces when you swallow causing a space. This can also happen with ball clasps. So sometimes a patient doesn’t need to wear their retainer full time. I usually have a patient, who just had their braces removed, wear a retainer for 6 months full time then go to night wear. Every orthodontist does retention treatment differently. You have to remember the orthodontist is making decisions specifically for each patient needs and sometimes a general rule will not apply. Ahh thanks doc! Yea the 2nd possibility seems to describe my situation precisely because i am indeed feeling a space from between my molar and premolar due to that wire (i had decided to start wearing my retainer for 24hr going against advice of ortho). I will stop that and see if the spacing reduces. Curious, is there a way to fix this? Do i ask my ortho at my next adjustment to do something about the space that will eventually appear at my canine area? Or is this a fact of life that i will always have a space between both my molar/premolar area AND my canine area because it seems like if i wear my retainer long (24hrs) it reduces the space at my canine but it opens up a bigger gap at my molar area. But if i lower my retainer use (ortho recommends only 12 hrs/day) it may(?) reduce the space at my molar but i know it definitely opens up a space at my canine. Thanks for any info and i apologize for the rambling. You need to discuss these areas with your orthodontist. They may suggest a different type of retainer, like a wrap around retainer or a clear plastic aligner that could help close all spaces. My son recently had a chain added to his braces at his visit last month. Tonight he said it broke and he was trying to get it out but thinks he swallowed it. Is this something to be concerned about? I left message for his Orthodontist but have not heard back from him. Thank you. Swallowing an elastic power chain will not hurt him. Your orthodontist will probably want to see him and place a new one. Hi. Well, i went to my orthodontist about my expander for a review appointment. I have my expander now for 11 days and have to wear it for another 2 weeks or so. He said there wasn’t much changed, only about a mm, and should have a gap teeth by this time.. Is this normal? What could be the cause of why there wasn’t much difference.. I turn mine once a day as he said. Rapid Palatal Expansion (RPE) is different from patient to patient because of various factors. If a patient’s upper teeth are crowded, a gap may not show up at all. The position of the expansion screw from front to back in the roof of the mouth, can change the rate of expansion. Also, in some cases, it takes some turns for the RPE to become tight enough to start movement. Lastly, I have seen some expansion screws reverse themselves. A patient turns it and it moves back. It’s rare but it can happen. All of these items can effect the expansion. Don’t worry about it and continue to do as instructed. They may increase the number of turns per day if the expansion is not progressing well. Are there any disadvantages to Temporary Anchorage device? I got braces 7 months ago. My orthodontist told me that Temporary Anchorage Device (TAD) will be required in my case. I got TADs implanted into my gums 3 days ago. I wanted to know are there any disadvantages or long term adverse effects of these TADs? Thanks for your answer. Yesterday, I felt that one of my screws got a bit loose & hence, I went to my orthodontist today who removed that screw & inserted it again into gum. Last time I didn’t experience any pain in my gums but today, I’m having pain in that area of gums where the screw has been inserted (& also in my teeth). Is that normal? When that area will get normal? & when I’ll get rid of this pain? It is normal. It may take about a week for the pain to completely go away. As each day goes by, it will be better. If you are still in pain after a week or it keeps you from sleeping, call your orthodontist for a checkup. Yes Doctor, my pain has reduced quite a bit now (infact, there is almost no pain in my teeth in that area, there is only some discomfort in my gums) . But there’s slight swelling around that area of my gums (where the screw was inserted after it got loose the first time). That area has also got little bit white in color. I’m bit confused that if the pain has reduced then why that area of my gums is having that swelling? Is it anything to worry about? & also, I didn’t feel any kind of pain or discomfort or swelling in my other side (right) where the other screw has been inserted, nor that screw got loose. Everything is normal in the right side. I’m facing problem only in my left side. There is usually slight swelling around the TADs for a while after placement. Just keep the area clean and the swelling should go down. What could be the reasons for loosensing of the screw (temporary anchorage device)?? After about 10 days of re-inserting the screw into my gums, I can feel that the same screw has got a bit loose again. Is it normal for the same screw to get loose after some time? It is only slightly loose though but I’m thinking of going to my orthodontist after 3 days (unless it gets even more loose) coz I’m having my exams at college now. Can it get even more loose by then? I’m not eating from my that side at all & I’m taking only soft foods now. & whenever one of the screws gets loose, is it always removed & inserted all over again?? Coz the last time my orthodontist did the same thing, it hurt really bad (I even got some slight swelling at that area). The failure rate for TADs is high, 25%. Call your orthodontist and discuss the matter. Age does matter when expanding the palate with a rapid palatal expander. Before the age of 15, the mid palatal suture will open up easily. After the age of 15, there is less chance it will open up. Surgically Assisted Rapid Palatal Expansion is done by an oral surgeon to open up the suture in the adult. Here is an informative RPE article in the Journal of Clinical and Diagnostic Research about palatal expansion. I have tmj problems which were triggered by the removal of 2 teeth for braces as a teenager. The dentist really hurt me and I didn’t return to have the braces fitted. I have an overjet of about 7mm and my jaw is just not aligned properly. Every winter I suffer with my jaw locking, aching, earache and headaches. I have been advised that by having braces now as an adult that this can reduce my overjet and this may alleviate some of the pain and pressure in my jaw and surrounds areas. To the contrary I have also heard that there is nothing that can be done for tmj pain. Could you please offer me some honest impartial advice. I do feel that I always have to jut forward my lower jaw, even to eat a sandwich as my bite is so poor. So to me it makes sense that this being corrected would help. But I don’t want to pay money for something that will not benefit me. I do appreciate it probably won’t rectify the problem totally. Thank you in advance. TMJ dysfunction can be due to a malocclusion however the reason is usually due to the patient clenching or bruxing. I believe you have a 50% chance of reducing your TMJ symptoms by having orthodontic treatment. Usually TMJ pain is due to clenching and grinding which may be relieved by using a night guard, sometimes called a splint. The splint in worn at night when you’re most apt to grind/clench and relieves muscle pressure which can cause pain. earache, locking and headaches. Further evaluation is needed to determine the best course of treatment. If the temporomandibular joint has significant structural deterioration, correction of the malocclusion may not help. Consult with an orthodontist and oral surgeon. Thank you very much for your reply. Very helpful information. Hi I was just wondering I have braces but my friend and I would like to go out for curry can I still go out and eat the curry? Sure, you can eat curry but it may stain your elastic ligature ties. The elastic tie is what holds the wire into the slot of the bracket. If it is white or clear, it may absorb the food color and change. i had braces couple of years ago. I never had tmj problem before braces. During the treatment course i had it, it was very uncomfortable just to keep my mouth close and there was pain at point where two jaws meet. Doctor fixed that problem. After completion of treatment braces were removed and i had fixed retainers both on lower and upper teeth. After six months of retainers, i removed them couple of days ago because i thought i had enough of it and i have no temporary ones. Two days after removing the retainer i’m having similar pain. Why i felt the pain and what should i do now? I’d have a consultation with your orthodontist. You may need a splint. Most patients with TMJ dysfunction clench or grind their teeth which causes muscle tension in the temporomandibular joint. The splint relieves the muscle tension and usually the pain. I am looking into getting 6 month braces. Will these work to align my top front teeth with the centre of my lip? Where my two front teeth meet and sit is to the left of my lip, if this makes sense. Also do they work for overjets too? Most of my treatment plans are two years. For minor tooth movement, maybe 9 to 12 months. If you have very, very little tooth movement needed, maybe less time. The lure of these programs is fast treatment time and the rate of tooth movement has never changed no matter what type of device is being used. Since you mentioned you needed your upper midline shifted and you have an excessive overjet, I’d say treatment cannot be completed in 6 months. It will take longer. Also, with short time frames, a higher relapse rate is possible. Your teeth could move back into their old positions. Please consult with an orthodontic specialist. They can guide you in what treatment modalities are needed. TMJ dysfunction does not affect your immune system. They are not linked. Hi! I’ve had my braces for a while and a wire popped out of the molar bracket. I also have a coil on that wire section. should I take the coil off and put the wire back in or should I wait for my next orthodontist appointment??? Call your orthodontist and ask what they want you to do. In my opinion, I’d remove the coil and put the wire back into the molar tube. If your appointment is soon, then the coil can be replaced then. If you just had your appointment, you may need to be seen for a repair. Firstly, whilst brushing and flossing today, I noticed a white patch above only one of my brackets, on my right canine/cuspid. I’m worried it’s de-calcification/calculus, but I have never seen it on that tooth (or any of my teeth) before I had my braces on, and obviously the teeth are cleaned thoroughly before they are put on. It’s also in a place that would be rather obvious to me when brushing in the mirror, though it’s not noticeable unless you look closely otherwise. I thought it could be the glue, but there seems to be a lot more of its application on this tooth and bracket compared to the other brackets. Is there any reason for applying glue more to some brackets? And is it probable that it IS glue? Secondly, some of the rubber bands don’t go fully around the bracket. This is hard to explain, but they are not broken. I trust my orthodontist, but I’m not sure why on only some of my teeth, the rubber bands around the brackets seem to only fit around one side. For example, the band will be around the hooks on the right, and the hooks on the left side will have no band. If you need me to draw a diagram, or explain further, I can try, but I have never seen this on any pictures before, or had it explained to me why the bands are fitted like this. I don’t understand why the band would only fit partially around the bracket, though it is not broken, and it has been this way since they were fitted. The wire and bracket is as normal, the band fitted around it just seems to be to one side. Is this to influence the tooth’s direction? I would like to emphasize that I always see bands going around the bracket fully. So, is this normal? What reason could this have? Also, some of my brackets have what look like hooks coming off, but I’m not sure what these are for either. Thirdly, there are some of my teeth with brackets on that aren’t connected with wire. I assumed this is because it would hurt too much: these teeth are very crooked and not in line with my other teeth. Am I right in assuming this? Could my orthodontist have still connected them with wire to speed up the treatment, albeit making it more painful? Finally, in my upper teeth, on my first molars, are these white coverings. The white coverings are on the top of the tooth, but obviously since they are my top teeth, it’s like the covering is on the bottom. I’m not sure what they are. They are not mirrored on my lower first molars. My orthodontist is an orthodontist only, not a family dentist, so it would not be a filling or some other procedure, and my appointment was literally only to have my braces fitted. (Besides, I’ve never had cavities, or anything needing other dental treatment. I’ve only ever had extractions in preparation for the braces.) I’m unsure as to what this is. Is this fitted a lot? What is it? I’m sorry if it was a lot, but I hope you can answer my questions. Sorry for any spelling mistakes or phrasing issues. First, adhesive can be excessive on some of your brackets and can appear like a glob of food or calculus. The adhesive is applied by hand so the amount can vary from bracket to bracket. At your next appointment, ask the orthodontist to remove it if it is bothering you. Secondly, the elastic ties do not have to go around all four wings of the bracket to be functional. Sometimes this is due to rotations of teeth, or the gum tissue is too close to the bracket or there is adhesive blocking the elastic from going under the wing. It is not critical that all elastic ties are around all the wings of the bracket. Thirdly, the wire will be placed into your bracket when adequate room is made to bring the tooth forward. No need in placing the wire into the slot of the bracket until it can be moved. Make sure you keep these areas clean. Finally, to help with movement of the teeth and to usually jump anterior crossbites, an orthodontist will at times place a composite resin on the occlusal surface of the molars to open the bite up. After the anterior teeth move, it can be removed. Thanks for your timely responses! And sorry for the length of my original post. I tend to be a worrier and get anxious over things like this, so thanks for reassuring me. Have a nice day. During treatment, the braces will apply pressure to the tooth but should not remove the bonding from your tooth. When the braces are removed at the end of treatment, care needs to be taken not to remove the bonding material with the bracket. Remind your orthodontist about the bonded tooth when braces are removed to avoid problems. Your orthodontist will be very careful when removing that bracket from that tooth. My orthodontist said that my palatal expander isn’t really expanding my upper jaw because i have finished growing, it’s moving my teeth instead and making it slant. I have a crossbite, and now, it kind of overlaps a little bit, i have my expander on for 5 weeks and little gap teeth. He said, i have to wear it for about 2-3 months, but i have to stop turning it. I have overcrowded teeth and underbite, concave face. What are other ways to fix this instead of surgery? Would a surgery be strongly recommended? Based on the fact that you have an underbite, crowding, a crossbite and you have finished growing, surgery maybe the only option for correction of your malocclusion. An oral surgeon would possibly perform a La Forte I osteotomy and a surgically assisted rapid palatal expansion. Your orthodontist will refer you to an oral surgeon for consultation and to determine the best timing for procedures. In some cases, surgery is the only option. I am 40 years old and have just started treatment with invisalign (level 5 – 20 sets of trays) for crowded teeth and a relatively large overbite. One of my front teeth is angled back and always has been, but some trauma to the tooth years ago pushed it slightly farther back, probably only by a couple mm though it seemed huge at the time. A few years after, my dentist built it up with composite material to even out my smile. I’ve been told by my current dentist who is overseeing my invisalign treatment that since the tooth was moved by trauma, the chances of moving it back are low. I know from the 3d models that moving this tooth is also not part of the current treatment plan. Just wondering if it would be worth seeking a second opinion as I know treatment can be adjusted. That tooth in particular, being my front tooth, is the one I am most concerned with straightening even if I need a veneer when treatment is over due to the composite being attached. You can always get a second opinion. To find an orthodontic specialist in your area use the American Association of Orthodontist’s website. You really won’t know if the incisor is ankylosed (non-moveable) until an orthodontist tries to move it. Sometimes a percussion test can be diagnostic by taking a mouth mirror and tapping on the crown of the tooth. If the sound is very low pitch in tone, the tooth may be ankylosed. If the tooth has discolored, it may be ankylosed. Since that incisor is important to you for the success of your treatment, a second opinion may be best. Hello, I am still currently in treatment for my braces. My question was for retainers with fake teeth attached. I am missing one lateral incisor on my upper right. Would i ask my orthodontist about the retainer with the tooth? Would i need two retainers, a clear plastic one and then a wired one with the tooth? She has never mentioned this as a possibility quite frankly I never knew it existed. My ortho wants me to get an implant however I refuse to get a dental implant. You can have either or both retainers, a Hawley retainer with a false tooth and a clear aligner retainer with a false tooth (pontic). In my practice, I like the durability of a Hawley retainer with a pontic. The pontic has less chance of breaking off with the Hawley. Each orthodontist approaches this problem differently. Just ask about your options, if any. Hi, I am 15 and I do NOT like where my braces are placed on my teeth. They are to high up, so when I talk you can’t even tell that I have them(I have a gap) and I was wondering if I go get them tightened could the orthodontist place them where I want them to be? Also can I get the chains early so my gap will close faster? This is only the third day I have had braces. 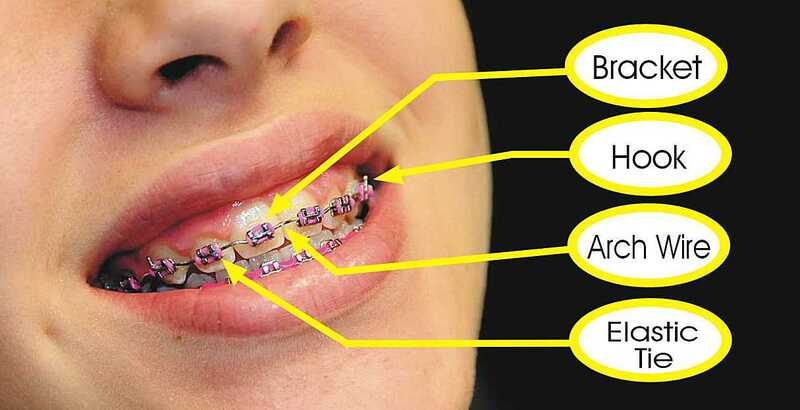 Hello, Your orthodontist has placed the brackets in the place that he/she is comfortable working with them. The position of the bracket does determine the torque of the tooth. I’d say your orthodontist will not reposition your brackets. however you can ask. A certain size wire is needed to use elastic power chains. Once the wire is changed to a larger size, a power chain can be used that creates bodily movement of the tooth and not just tipping to close the space. There is nothing that you can do personally. You need to ask your orthodontist to remove the excessive adhesive at your next appointment. They will take a high speed bur or scaler and remove it. If you try to remove it, you will break your brackets off of your teeth. I’ve worn my retainers and I am almost finished with it but it keeps damaging the top right portion of my gums and is starting to affect my teeth by leaving an imprint on the certain spot. Should i continue to wear it for the next two days or not? You will have to call and talk with your orthodontist for instructions. Your retainer may need adjusted so that it is not hurting your gums or teeth. I have been wearing braces for a little over 2 years and get thrm off in 2 months. I have an overbite and have been wearing class 2 elastic for a whole on my left side. On my last visit I was told to still wear the class 2 on the left, and class 3 on the right. I wanted to know if it is normal to get class 3 elastics on one side while I have an overbite. Any help would be appreciated. It is ok to have a Class II elastic on the left and Class III elastic on the right. Chances are, your orthodontist is shifting your midlines so they will match. If you are concerned about your overbite, make sure to discuss this matter before your braces are removed. Hi there, i recently had my braces taken off after about 1 year of wearing them. I was fitted with an essix retainer top and bottom and a wire on the back of my front top teeth on the day i had them taken off. After about two/three days i noticed my teeth have started to move. It is only at the top and only seems to be the two lateral incisors. After a couple more days the movement seems to have stopped but i cant help feeling that my teeth are not the same as they were when my braces were taken off. Is this movement normal? Or is is possible my retainer is faulty and not working. Thanks. A clear plastic retainer (essix) can hold your teeth to a certain extent but some tooth movement will occur. We call this tooth movement “orthodontic settling”, where the natural forces move the teeth while wearing a retainer. We control any adverse movement with the retainer and make adjustments to the teeth to eliminate pressures being applied. In your case, interproximal enamel reduction is needed to keep your lateral incisors from rotating. Once the enamel is removed, the retainer will push them back into place. We wanted to openly thank you for the consultation you provided to us about how best to proceed with the Orthodontics for our daughter when we move mid-procedure. Our questions were complex as we were dealing with conflicting information regarding our daughter’s ongoing Orthodontic care, from two different Orthodontists, from two different countries. . Anyone who is willing to help complete strangers with their Orthodontic questions and provide sound and expert advice online, must be a very good person who truly cares about people and the difficult decisions that have to be made surrounding these sensitive (and expensive) issues. We truly wished you lived closer so that you could be our daughter’s permanent Orthodontist. Again, thank you for everything! Hi, I’ve been in braces for almost 3 and 1/2 years, I’m 15. My orthodontist said that I was almost done with treatment if everything goes as planned. He put a powerchain on me to close 2 gaps up on the top and told me to come back in 2 months, it’s almost 2 months now i go back next week but the gaps didn’t close. I feel like the reason why it didn’t close was because it’s not straight like the others I mean it’s not really noticeable but you can feel it. It’s kind of turned out and I was wondering if there is anything else besides a powerchain that can close the gap or if maybe he needs to places the bracket on my tooth a little differently. What do you think? Any suggestions or answers you can give me? Sometimes a space doesn’t close due to friction between the wire and the bracket. Your orthodontist can a different wire or buff the wire to allow the brackets to slide along the wire. There are other ways of closing the space. For example, to move molars mesial, pull coils can be used. Spaces can be hard to close at times. Just be patient. I recently ran into a situation where I lost my upper retainer after having it for almost three years after my braces got taken off and wearing it as recommended by my orthodontist (every day for the first 6 months and then every night from then on). Unfortunately for me when this happened I was very busy and couldn’t get my teeth fitted for a new one until about three weeks after. When I did get fitted for the new one my teeth had shifted slightly, but nothing was noticeable besides the fact that there was a very slight space in between my two front teeth. I got the new retainer about two weeks later. My orthodontist had given me an active retainer to close the slight gap that had formed in between my two front teeth. My orthodontist said that I only needed to wear it at night. I’m confused about him telling me I only have to wear it at night. The fact that it’s an active retainer makes me think that it would do nothing if I only wore it at night since my two front teeth wouldn’t have pressure on them during the day from the retainer. Wouldn’t this end up doing nothing to close the slight gap in between my two front teeth in the long run? In some cases, night time wear will close a space. If you see that the space opens during non-wearing hours, go to full time wear. It will not hurt anything. I have had my braces on for 2 years and 3 months. My orthodontist said that before he removed my braces he wanted to create a small overbite so as to not have my upper and lowers right on top of each other and to prevent tooth enamel loss from my teeth grinding. To correct this he filed in between my teeth that created gaps and put me on rubber bands. The teeth came together but the gap never fully closed. However he filed some more in between my teeth and created more gaps because my teeth are still on top of each other. I am worried because I fear now the gaps won’t close. Also I should note that when I go there are multiple Orthodontist in the practice so you never know which one you will see until you get there. Is this normal to have multiple orthodontists working on you and will my gap close? Your gaps should close and your overjet should increase by wearing the rubberbands. As far as multiple orthodontists, I have always practiced solo so I’m not familiar with how they operate. If you are concerned with continuity of care, ask to be seen by the same person. You might have to go on certain days. Continuity of care is important. I’ve had my braces for a year and a half now, and are due to get them off in two months. My concern is that I have a white mark in between two of my teeth -that were originally crooked- and was wondering if it was anything serious. Its not completely obvious, but definitely visible if you look closely. My ortho hasn’t really mentioned anything about it, but I can’t help think that its something serious, and if it can be removed after treatment? The white spot is either fluorosis or decalcification. Fluorosis is a white spot on the enamel that formed when the enamel formed. Decalcification is a white spot due to plaque starting a cavity. If it is fluorosis, nothing needs to be done. If it is decalcification, you may have to have the tooth restored after the braces are removed. So how would I know whether it was fluorosis or decalcification? Is there any distinct differences? And if it is decalcification, how can I get the tooth restored? You’ll have to see your family dentist to determine if it is a cavity. If it is, a tooth colored composite filling will replace the cavity by your dentist. A half a millimeter is not a large space. Ask your orthodontist about it. We usually use elastic power chain to close spaces. It is good to get all spaces closed before braces are removed. This prevents food impaction. thank you for replying! i already have a power chain on my upper teeth and normal bands on my bottom, i have recently watched a you tube video where a girl claimed that she had a gap in a similar place so her orthodontist used a stronger power chain on her top while she removed the bottom braces. when the bottom were fully done, the top gap was closed and her braces were ready to be removed. would this happen with me? It is possible but I like removing upper and lower braces at the same time because certain records are taken at the end of treatment. Wow, what an awesome service you provide! Thanks. I am an adult patient with Damon braces since Oct. My upper lateral incisors were/are grossly rotated, having erupted nearly perpendicular to the centrals. These teeth are also somewhat smaller and will likely need bonding for a perfect look. My appt. are every eight weeks due the Damon system. At my Feb. appt. my orthodontist changed me to a heavier but still round wire and told me that I would see a noticeable improvement and straightening of the laterals by the next appt. The left one had rotated somewhat but the right one had not. There was also a slight gap between the central and lateral incisor on the right which I understood was necessary to make room for the rotation. In March my daughter had an appt. with the same orthodontist and he again noticed the gap, which had increased, but there had been no rotational improvement at all. We discussed a power chain, but decided instead to tie these brackets to the wire and once again, he told me I would begin to see improvement. Now, I was getting anxious. After a couple more weeks, my lower wire came out of the sevens on both sides so I returned and again inquired about the lack of rotation on the upper lateral incisors. He decided to reposition the brackets and said we would do a power chain and heavier wire in April. Again, the only movement was an increase in the space. About two weeks ago I went for my April appt. He put in my first rectangular wire and a power chain on the four upper incisors. Again he assured me I would begin to see great improvement. Well, within twelve hours the space was completely closed, but there has still been little to no rotational improvement. Am I expecting too much too soon? I have seen incredible improvement and movement on my lower teeth, but these two top ones seem to be very stubborn. Honestly, if the orthodontist wasn’t telling me these teeth would show improvement, I wouldn’t be so anxious. I am concerned these stubborn teeth will prolong my treatment with their seeming refusal to move. He did assure me he’s never encountered a tooth he couldn’t move, but I’m beginning to wonder if mine will be the first. He is a great orthodontist and has treated my three children with great results. Is it unusual for some teeth to be so stubborn or is he maybe being too optimistic? Secondly, I have found it to be very difficult to keep my lips closed over my braces and teeth at night while I sleep. I will often wake up because my mouth is so dry from being open. I had hoped this would improve as I got accustomed to the braces, but sadly it has not. I now find that I am clenching my jaw to try to keep this from happening. I am afraid I will create a bad habit that will continue even after the braces come off. I have a class one bite with a deep bite. I’ve never had a problem with grinding, clenching, or my joint. Is this normal for some people? Should the clenching concern me at this time? Thanks so much! I look forward to you response. In the general population, some patients teeth will become ankylosed and not move. It can happen after trauma or for no reason at all, idiopathic. Ankylosis is when the root and the bone fuse together across the periodontal ligament which is not normal. Every orthodontist encounters teeth that will not move. I don’t know if that is the case in your situation. Besides observation, a percussion test can be done where a low frequency pitch can indicate ankylosis compared to adjacent teeth. Time will only tell if the laterals will move. When teeth are moved during orthodontic treatment, occlusal interferences occur causing some adult patients to start clenching. As your occlusion gets better, the clenching should lessen or stop. This clenching is subconscious and the patient is trying to push their teeth into a comfortable position. Tell your orthodontist what tooth interferences and pre-maturities you are experiencing. If that tooth can be moved faster out of the way, your clenching may decrease. If the tooth is ankylosed, would it move at all? I am quite sure it has moved side to side. First a gap opened between the lateral and central incisor, and then it closed up when the power chain was added. Since this created a slight gap between the lateral incisor and cuspid, I’m pretty sure the lateral moved, just not rotated. The power chain doesn’t extend to the cuspid and no space opened between the central incisors. Also, today that lateral incisor has been very sore even though it’s been two weeks since my appt. and the initial discomfort from that adjustment had subsided. I took some Tylenol (I don’t handle ibuprofen well), but it still hurts. Should I be concerned or happy that maybe it is finally moving? If by chance it is ankylosed, would it have to be removed for sure? I’m 40, so it’s been there all this time just fine other than it’s position. Could a veneer just be put over it if it refuses to move? Corie, ankylosed teeth do not move. I’d say your laterals will rotate and obtain a good position, based on what you have said. If they do not rotate, there are other options like a veneer or crown that can be done. I’d keep the tooth if possible and not have it removed. I got my braces about two weeks ago and I recently got a Trans-Palatal Bar to expand my mouth to fix my cross bite. However I can’t eat with out gagging and when I can eat the food does not taste right. Is this normal? If you cannot eat at all, the transpalatal bar may need adjusted or remade. Give yourself some time to get use to it. See your orthodontist if you completely stop eating. There will be a metallic taste for awhile but it should diminish over time. I was just wondering would anyone know anything about the period of time I will have to wait to get my braces off. I have a small gap in my front teeth that needs correction, My top right side of teeth are straight. Along with my gap problem, I also have one other discrepancy, The tooth that is on the left side, right beside my front tooth (Sorry if that’s confusing) has grown slightly sideways because of the baby tooth problems I had, it seems to be positioned a little behind the others. Other than that my teeth are fine, And my bottom teeth are straight. Also, do you think I would be a candidate for clear braces or invisilign? Any advice or comments would be helpful! After an examination, an orthodontist can give you an estimate of how long treatment could last and what modalities are available. Usually treatment times are 12 months to two years. For minor tooth movement, clear plastic active aligners can be used. Standard braces gives the best control for optimum results.